An all purpose TIFF Viewer, TGA Viewer, JPEG Viewer that allows you to Find, View, Edit. and Print Picture and Image Files, plus Find and Play Multimedia Files. 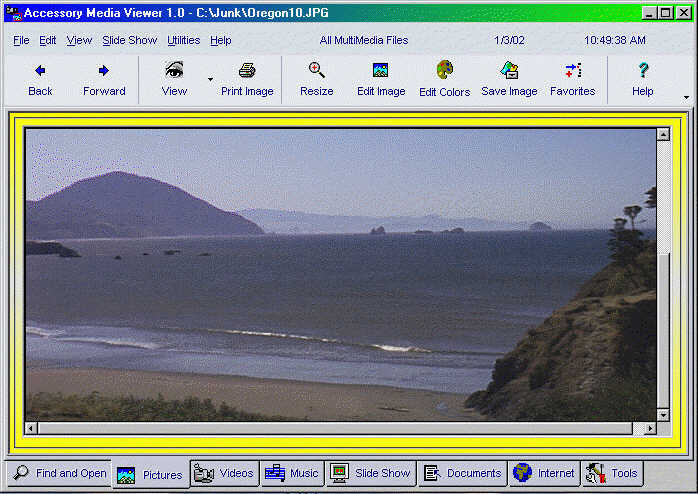 Multimedia Viewer - Search for major multimedia file types, display, edit pictures, print, play Multimedia Files, and surf the Internet. Edit Picture/Image Files with techniques as Flip, Reverse, Rotate, Resize, Brightness, Contrast, Color Saturation, GrayScale, Hue, and other special effects and filters. File Types supported are JPG, CMP, uncompressed TIF, TIFF, BMP, ICO, CUR, PCX, DCX, PCD, FPX, WMF, EMF, FAX, AWD, XPM, IFF, PBM, CUT, PSD, PNG, TGA, EPS, RAS, WPG, PCT, CLP, XWD, FLC, ANI, SGI, XBM, MAC, IMG, MSP, CAL, ICA, TXT, BAT, LST, WRI, SYS, RTF, HTM, HTML, ASP, DOC, AVI, AVI(DivX), MPG, MPEG, MOV, MP3, M3U, ASF, MID, RMI, MP2, AIFF, QT, WMV, WMA, etc. Save a list of any number of Files from any location on your PC or Local Network using your Favorite File Lists for quick location. Find and Play WAV, MID, RMI, AVI, MPG, MPEG, MOV, and MP3 files and save locations in Play Lists. Print Pictures with Titles for page and picture. Select your font and color for all printed text. Standard File Utilities as Save, Delete, Rename, and File Properties. View Pictures on other computers accessible by the internet. View Text, Documents, and Web Pages (HTML). Separate Play Lists for Video and Music Files, and Separate Play Frames. Surf the Internet while playing music or viewing Videos. Great Slide Show with hundreds of Transitional Effects while playing selected MP3, MID, RMI, or WAV files in the background. All Media Fixer - A handy tool that help you one click to repair media files which can not be played or dragged. Blaze Media Converter - media converter, media editor, media player all in one software. Hot !